So excited to try this made in U.S.A., patent pending, No-Touch Facemask TM and Hoodie TM! Boasting one size fits all, comfortable concealment, no loss of peripheral vision, easy use in the field, I'm anxious to see how it performs. 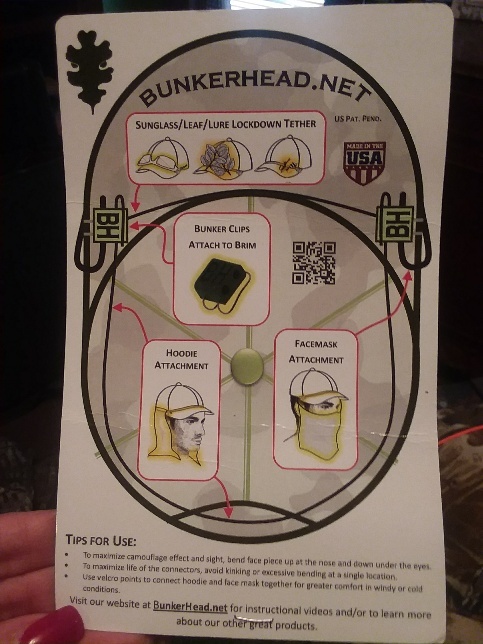 The main attraction is the BunkerHead CLIP system that connects the face mask or optional back of “hoodie” net. · I really like the gauge of mesh. · Camo pattern blends in with variety of seasons. · Generous amount of fabric to either hang outside your clothing or tuck in. · Hardware is well made molded plastic. · Mesh netting is sewn well over the wire attachments and hemmed nicely. · Lots of space between your face and the net, loving this. Keeps my glasses from steaming up. · Nice detailing with Velcro tabs to connect from to back netting. · Elastic serves as bonus sunglass, leaf, or lure lockdown tether. 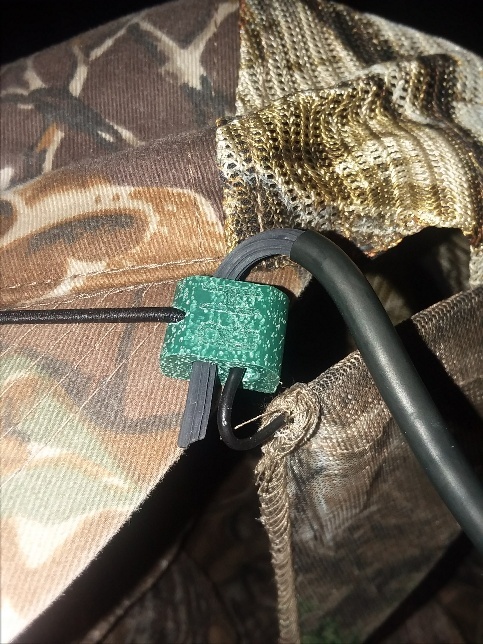 · Bunker Clip is so rugged and sturdy that it's difficult to pry over brim of my hunting cap. o Note: my TEST cap has a "sandwich visor"
· When used w/ optional “back of head, hoodie attachment” netting, the attachment slipped off often as I moved around, once I got the wire pushed thru and bent over the clip, I'm good. · Spent a bit of time adjusting and readjusting wires. o Perhaps that's to be expected first time around. Other than some minor wire readjustments, I'm off to get stealth without fogging up my glasses at the most inopportune time! In stoked for “hoodie” coverage too.